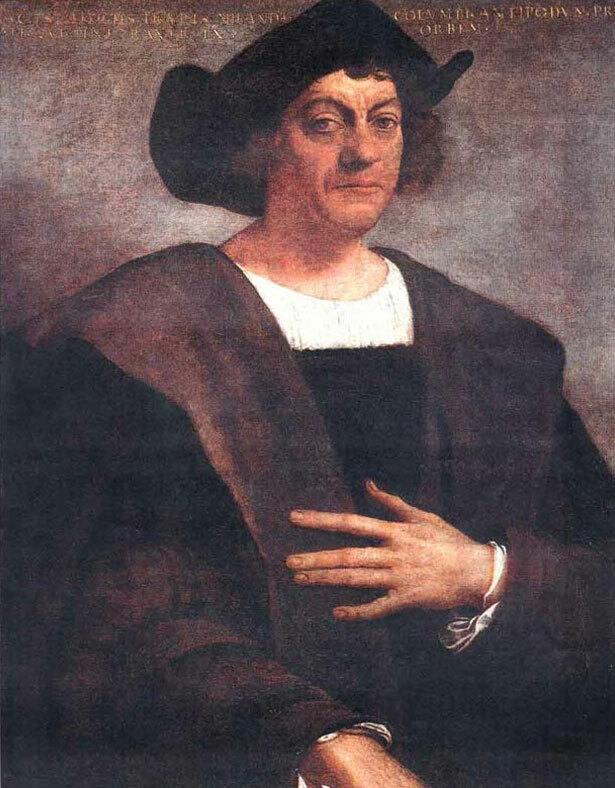 Christopher Columbus (1451-1506) by Sebastiano del Piombo. There are no portraits of Columbus made during his lifetime. Columbus Day, for me, is a complex and conflicting event. On the one hand, Italian-Americans get only one day a year to celebrate their heritage, as well as their contributions to American society. For years, Columbus was the only Italian in any social studies textbook—I mean the ONLY one. In a world where others saw us through Don Corleone, Tony Soprano and the Super Mario Brothers, Christopher Columbus was our shining model. He was proof that Italians need not be criminals to succeed on this continent. Yet the decades of historical revision about him cannot be ignored. Few individuals have had such a pummeling in the historical narrative as Columbus. In academia, Columbus-bashing is a cottage industry: you’re not even considered a credible historian if you don’t rough up old Chris at least a little bit. Like an incoming tide, the knocking of Columbus involved numerous waves and relentless advances. First came Leif Ericsson: the red-headed Viking who was supposedly the “true discoverer” of America. He set up a small encampment in Newfoundland around the year 1000, only to be summarily drummed out by the natives. My dad thought Ericsson was a conspiracy by WASPs (White Anglo-Saxon Protestants) to undermine Columbus’ legacy. In my house, you couldn’t even say his name. Next came the Chinese theory—specifically the voyages of a Ming-dynasty explorer named Zheng He. The story goes that Zheng led the Chinese fleet to the American continent in 1421, well before the Columbian expedition. It received even more attention in 2002 with the release of 1421: The Year China Discovered the World by former British submarine commander Gavin Menzies. The book is largely discredited by historians today, since Menzies has no command of Chinese and therefore no knowledge of the primary source material—material Menzies claimed was destroyed by subsequent emperors due to financial difficulties. Yet the idea will not die. Even the stone-cold fact of Columbus’ first voyage has been downgraded from a “discovery” to an “encounter”, as if Chris and the Taino were matched up on eHarmony using their ridiculously long questionnaire. Yet nowhere has Columbus’ reputation suffered more than with his treatment of indigenous peoples. He’s pretty much persona non grata on every Native American reservation in the Americas. Dartboards have him next to such Native-loving luminaries as Hernan Cortes, Francisco Pizarro, Andrew Jackson, and George Armstrong Custer. Worst of all, the historical record supports this negative view. The following is from Columbus’ journal entry of October 14, 1492 (NOTE: I use Columbus’ journals and not his Letters to the Sovereigns, in that in the latter he has that innately human quality of candy-coating the situation for his superiors). From 1492 to 1503, Columbus’ administration of these emerging Caribbean colonies was an unmitigated disaster. The economy was mismanaged. Administration was often arbitrary and tyrannical. No one wanted to leave Spain for a mismanaged shithole island 3000 miles away. The natives were being abused, to put it mildly. The native populations of Columbus’ “Indies” would die off within a generation, a feat nearly genocidal in its size and scope. Most importantly for Spain, the gold wasn’t coming. No spices, either. Jewels? Silks? Tea? Nope on all three. It won’t be until the subsequent adventures into present-day Mexico and Peru that the Spanish could finally pester the natives into profitable labor: hauling gold and silver to fill the galleons of the treasure fleet. So in the wake of the savage beating that history has given to Columbus’ reputation, who is the real Columbus? And is there enough good to salvage Columbus’ holiday from total irrelevance? When looking at Columbus as colonial administrator, there is little that can help his case. Most of the atrocities that occurred under his jurisdiction really did occur. Yet it is important to understand an integral aspect of most great men of history: they are both ahead of their time and of their time. The abuse, terror and corruption on Hispaniola would prove to be par for the course. Columbus’ successors in Spanish America were no prizes, either: reading Bartolome de las Casas’ accounts of native atrocities would make anyone cringe. So it’s fair to say that even though Columbus failed, his contemporaries probably couldn’t do much better either given the circumstances. Yet despite his shortcomings—and they cannot be ignored—Columbus’ courage, tenacity and seamanship in directing such an unprecedented voyage do cement him a place in the history of our civilization. Whether you admire or abhor the man, this much is true: Columbus’ first voyage was a world-changing event. A barrier that seemed impossible was now breached; in fact multiple times, by Columbus himself. Two worlds once isolated now formed a new and transformative connection, for good or ill. The development of two continents, and subsequently the world at large, could have taken a far different course had the voyage not succeeded. Furthermore, even if you don’t believe the age-old canard (and I don’t) that Columbus proved the Earth was round, you cannot deny his chutzpah. Nobody, and I mean nobody, was taking his place as being brave (and crazy) enough to sail west across the ocean. It took some real cojones to sail towards the horizon with only a vague idea of where to go, how to get there, and how long it will take—especially when his measurements were wrong. So as teachers, we should make sure Columbus gets his day in the sun—warts and all. Please, no more crappy wall decorations with three pathetic sailboats and what looks like Buster Brown in a funny robe saying hi to what appears to be Sitting Bull and the Hekawi tribe from F Troop. Give your students the real deal about the voyage, the dangers, and the historical significance of reaching the Americas. Yet make sure to not hide Columbus’ shortcomings under the rug, so to speak. The guy made mistakes—some royal mistakes. He set a pattern for colonial mismanagement unprecedented in world history. Acknowledge the situation he faced and see if your students would have handled governing the Indies differently. Finally, to all those who view October 12 as a day of genocide, sadness and horror: I know. You don’t have to repeat it. However, anyone else wouldn’t have done much better (just ask his successors). Certainly, no one else was ready to take the enormous risk Columbus did to sail the ocean sea to parts unknown. So from one crazy Italian to another, I salute you. Happy Columbus Day!